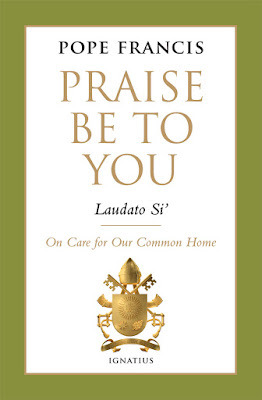 So I read Laudato Si. Warning: It's the Russian novel of encyclicals. It just goes on and on. I felt like I was reading social science texts back in Cegep. There were quite a few good pro-life passages. I knew he wouldn't let us down on that front. On the whole, I'm fairly "meh" on the whole thing. I can't buy into the encyclical's alarmism. The idea that we're on the brink of disaster doesn't ring true to me. Yes, I think there are problems. But no, we're not on the verge of collapse. Mostly because: if we were on the verge of collapse, scientists and the markets would do something about it. I was not really keen on the call to eliminate use of fossil fuels. My problem with this encyclical is not what the Pope said (although I disagreed with some of it.) Intelligent Catholics know that Catholics may disagree with the pope on any doctrine that is not rooted in the Divine Deposit of Faith, aka Divine Revelation. An analysis of the current situation, and suggestions for the solutions to current problem are not part of the Divine Deposit of Faith. My problem is that there are many people in the world who do not understand how Catholic doctrine works and will exploit this encyclical to advance and agenda that is ultimately harmful. They will use the accusation of hypocrisy to silent Catholics who insist on fidelity to the teaching on contraception, but do not adhere to the Pope's ideas on fossil fuels. I just hope that whoever does the accusing remembers that the Pope never meant for his encyclical to be an excuse to abandon the pro-life cause.